Energy Efficient Windows Madison WI | What Makes Windows Energy Efficient? Energy efficient windows are the most advantageous among homeowners in the Madison, Wisconsin, area, and throughout the country. They help ensure that heat stays in your home during the winter and that cool air doesn’t escape during the summer, which puts less strain on your HVAC system to maintain comfortable indoor temperatures year-round. This leads to an increase in energy savings each month that can add up significantly by the end of the year. Low-E glass – Special coatings help reflect infrared light, keeping heat inside during the winter and outside during the summer. They also reflect harsh UV rays, which protects interior furnishings from fading and discoloring. Gas fills – Odorless, colorless, non-toxic gases, such as argon or krypton, are filled in between window panes to help insulate better than regular air. Warm-edge spacers – A spacer keeps glass panes the correct distance apart, which reduces heat transfer through the window. At ABC Seamless Home Specialists, we provide Madison, WI, area homeowners with vinyl windows that are designed with all of these features and more. 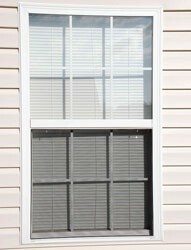 In fact, they are among the most energy-efficient window products you’ll find available on the market today. Contact the friendly and knowledgeable professionals at ABC Seamless Home Specialists today for additional information about the energy efficient windows we offer. We have an A+ rating with the Better Business Bureau and are happy to serve homeowners in the Madison, WI, area.